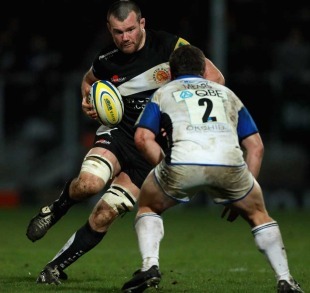 Exeter captain Tom Hayes is backing his side to continue where they left off when the new Aviva Premiership campaign kicks off. The Chiefs surprised many in their debut season in English rugby's top flight by finishing eighth with an impressive 10 league victories under their belt including the scalp of eventual champions Saracens. The squad will report back to pre-season training on Thursday and Hayes, who is set to begin his fourth season at Sandy Park, insists his side are aware they need to raise the bar once again. "It's not about aiming for a higher position, but about improving as a rugby side and moving the whole club forward," he said. "If that brings a higher position then great. Rugby is getting harder and faster and improving all the time. If we can improve quicker than other teams we can finish higher in the table, if other clubs improve quicker than us we may improve but still finish in a lower position. "I think every individual has to try to improve, that's going to be the big thing to keep improving as a squad. Last year is last year, it's gone now and we have to start looking forward and improving all the time. There's still a long way to go and no one is assured of their place, we'll all be fighting for the jerseys during pre-season." Lock Hayes, who played every minute of the Chiefs' Premiership campaign, faces increased competition for a place in the Chiefs' starting XV next season following the arrival of former Bath lock Peter Short and Aly Muldowney from Glasgow. But Hayes, who was named skipper in the ESPN Premiership Team of the Year, is looking forward to the challenge of keeping his place in the side. "I think the two boys signed in the second-row are going to take us forward and they may take a place next season or will certainly be pushing for a place. "There is always an excitement about the new season starting and we have a couple of new players to bring in as well. We'll be putting our game plan in place and one of the good things about this squad is that we enjoy doing that we have a good input into it. The coaches are very good at getting us involved and talking about things and we'll make the most of the time we have available before that first game against Connacht." Exeter, who have also brought in former Harlequins winger Gonzalo Camacho, face Connacht on August 13 as they look to kick-start their pre-season campaign which will see them then face Cornish Pirates on August 20 and then Scarlets on August 27 ahead of starting the new season in September. Hayes is aware of the need to start the new campaign well and hopes his side take advantage of the games during the World Cup. "Last year, when it was our first season in the Premiership, it was when the fixtures came out that it really sunk it we were in the Premiership," Hayes said. "It will be interesting to see who we have got and when this year but I don't think it is going to change the way we attack games or approach games. "If we don't have many players selected for the World Cup and other teams do it could work in our favour who we play during that period, but it won't affect the way we prepare for the season. We said last year we would use the Championship finals as a launch pad and we will look to become a better rugby side again this season."